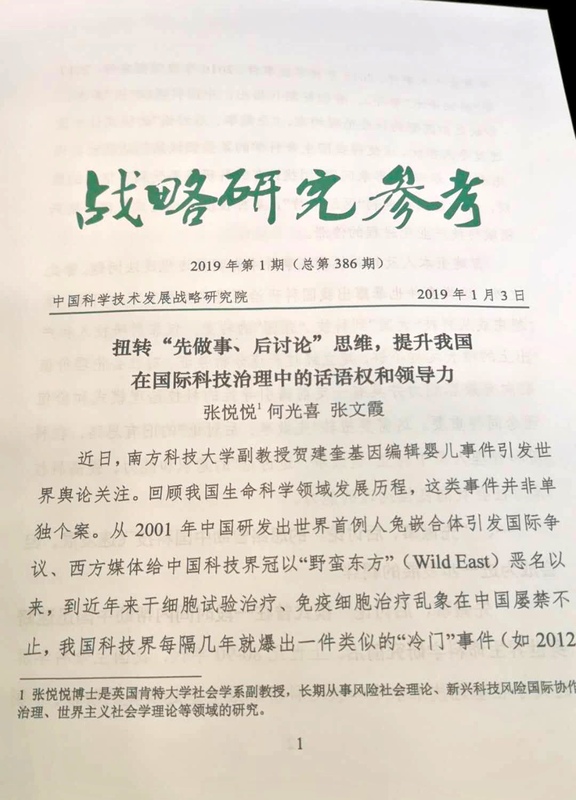 On 3 January 2019, Ministry of Science and Technology in China has officially accepted Dr. Joy Zhang’s policy recommendations on increasing transparency and public accountability of Chinese science and have circulated these recommendations in their Neican. 'Neican' refers to valued policy submissions which are put forward to ministers and other high-level officials. For social research to be featured in Neican is highly uncommon even for academic projects funded by China and would be considered as a 'major research achievement' within China. To accept Neican from a British sociologist and based on UK-funded project is even more rare. A set of recommendations were based on empirical findings from this ESRC project, Governing Scientific Accountability in China. In her submission, Dr. Zhang pointed out five action points: 1) capacity building among stakeholders on public dialogues and embedding engagement and public outreach throughout scientific projects; 2) making ‘self-assessment on social responsibility’ as a requirement for funding applications and grants' period reviews; 3) a shift to proactive and precautionary governance ethos, informed by both quantative and qualitative studies of public opinion (qualitative studies were rare); 4) promoting interdisciplinary and transnational exchanges on ethical governance through regular academic and regulatory meetings; and 5) encourage participation in global ethics and regulatory dialogues at all levels. This Neican publication is a significant and welcome signal that Chinese authorities are exploring ways to enhance transparency and accountability of its science. This push for policy change is part of a series of efforts Dr. Zhang initiated over the past three years to promote accountable and mutually beneficial research collaborations between China and the UK. This is a collective effort and we want to thank everyone who have contributed to this project, especially our interviewees and participants of our workshop and conference.